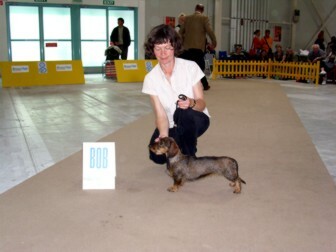 19.5.2007 Artemis won Ex1, CAC, CACIB, BOB and 5.BOG in Litomerice on International Dog Show. Chnapinka was only her company. Dalamanek Valentinka – father of Artemis – became Czech Work Interchampion this week. Congratulations!!! 18.5.2007 Chnapinka is 4years old today. 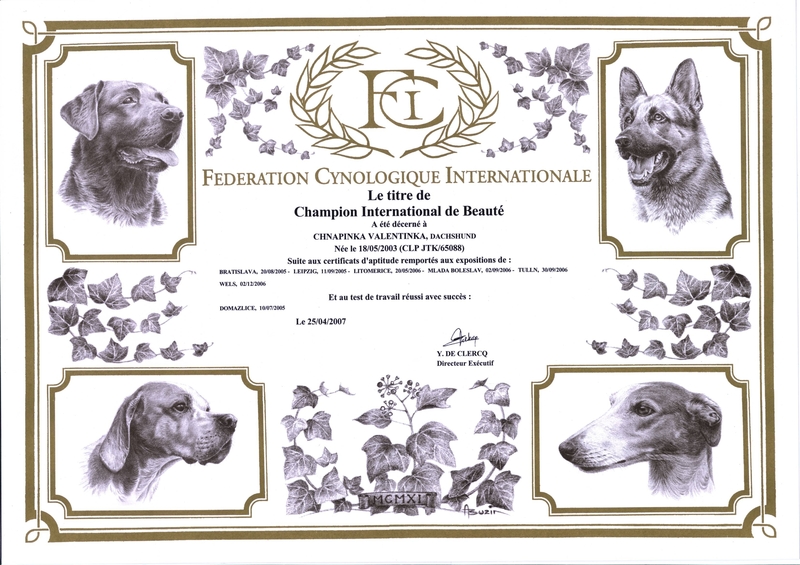 She got from FCI Belgium Thuin very nice present some days ago – diploma of Beauty Interchampion. 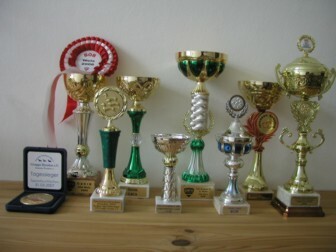 She needed to do work exam and she had to collect much of cups and medals. In the picture there are not all of these judgements at all. She made us happy for many times. 12. a 13.5.2007 We went to the two shows in Bratislava. 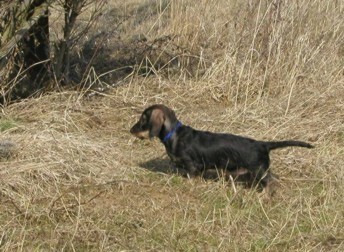 We had a trip to Telc, where Chnapinka and Artemis were fascinated by grass and pool in the castle garden. 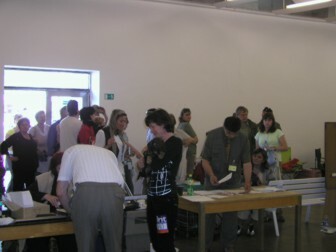 On Saturday there was Internation Show in Bratislava. Artemis won EX1, CAC. She was walking in young class. 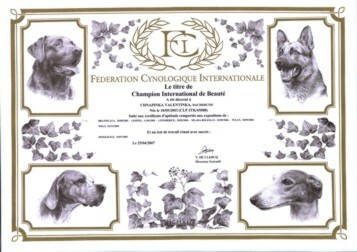 Chnapinka won EX1, CAC, CACIB in champion class. Finally she won BOB. In club show we were not so right on Sunday. Both girls were walking in the same class like in Saturday and both got EX2, Chnapinka res.CAC. 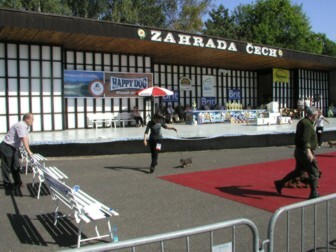 21.4.2007 On International Dog show in Ceske Budejovice, ARTEMIS was first time in interclass (after her crowning 15months). Along the table´s judgement she show us sprightly temperament.But in the ring she tried to retrieve errors. Mr. MVDr.Broz gave her EX1 without any title. Our expedition was little bit sad about that, but all was change when we visited our offspring AFRODITE, in Hluboka nad Vltavou. She is living with Dvorak´s family. She´s doing well in here, she has ever-loving gent and lady, living in very beautiful atmosphere and she has all she can wish. Many thanks to Dvorak´s family. 15.4.2007 International show in Erfurt. 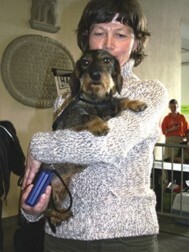 Our Artemis won EX1, VDH-CAC/J, DTK-CAC/J, Landesjugendsiegerin Thüringen 2007. 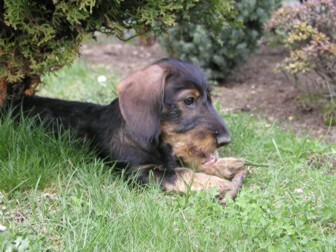 31.3.2007 On special dachshund show in Dresden Artemis won EX2, DTK-CAC/J in young class and in show she closed with 2nd place. Chnapinka walked in champion class and she won E1, VDH-CAC, DTK-CAC, Best female in breed, BOB and BIS / Tagessieger Spezialzuchtschau Dresden 2007. 25.2.2007 Artemis visited special dachshund show in Holysov. She won EX1, CAJC and she met condition to get a title of CZECH JUNIOR CHAMPION. 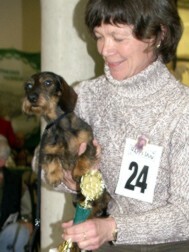 22.2.2007 Chnapinka received certificate AUSTRIA CHAMPION. 10.2.2007 We get out to International Show in Brno. It was show only for ARTEMIS. She got EX1, CACJ. 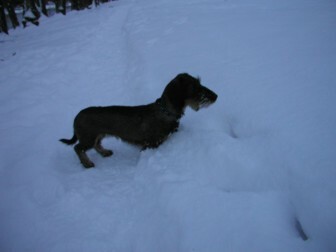 Both Chnapinka and Artemis was idle away one's time a snow all January. 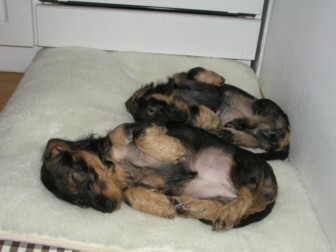 2.12.2006 Chnapinka had very successful day. 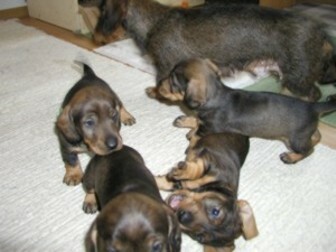 She was in Austria Wels, where she was marked V1, CACA, CACIB and BOB by Mr.Salvatore Tripoli. In group show she won 3rd place (3.BOG) by Hungarian judge A.Korozs. 9.11.2006 Chnapinka and Artemis were on World Show in Poznan, PL. Competition was really excellent, Chnapinka was in the champion class with another 13 beuaties and Artemis in young class with another 14 females. 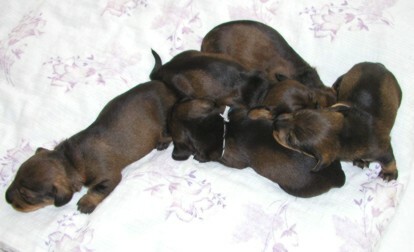 Both won classification „excellent“from Mrs. Witkowska and Artemis broke through 7 females. 29.10.2006 On Club Show our Artemis won V1 CAJC, Club young winner. Chnapinka won V2, res. CAC. 9. a 10.9.2006 In Leipzig Chnapinka was appreciated with V1, VDH-CAC and V1, VDH-CAC, DTK-CAC. 2.9.2006 Internation Show in Boleslav. 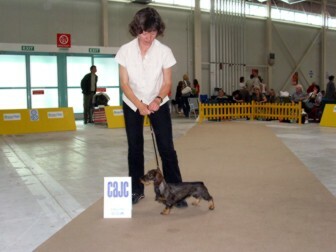 Chnapinka won V1, CAC, CACIB and she met the needs to be INTERCHAMPION. 19. a 20.8.2006 Two day´s Internation Show in Bratislava. Chnapinka won EX1, CAC, res.CACIB and EX1, CAC, res.CACIB in work class and Artemis on her first show in puppy class won VN1 and VN1, the best puppy female. 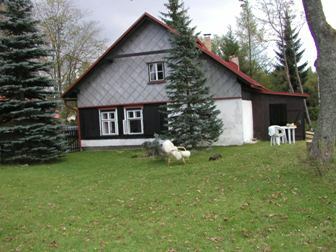 10.8.2006 I bought little cottage in Krusne Hory for my Chnapinka and Artemis. 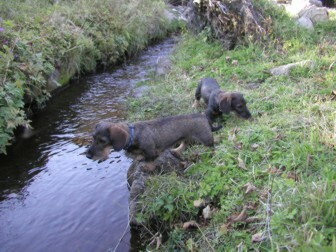 First they looked into and they are very excited with big garden and Chnapinka with passing stream. She is fascinated about it and she tear into water for every blade or leaf. Both were very happy about this cottage. 8.8.2006 Artemis unriped bit of carpet in bedroom. Maybe she was little bit bored. In June Artemis lost eyeteeth and now she has new ones. It´s good situated. She has both M3. She is full-dentitioned. 20.5.2006 International Show in Litomerice. Chnapinka won EX1, CAC, CACIB and Artemis visited this show to see how it looks. 15.5.2006 This afternoon our Afrodité (Frodi) was leaving with her new parents. Leave-taking with her was very hard. 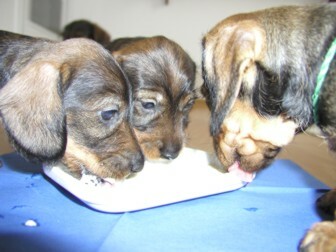 13.5.2006 OV Plasy – Chnapinka´s first time show after puppies born. She won EX1, Winner of winner´s class, regional winner. Afrodite and Artemis were her company. 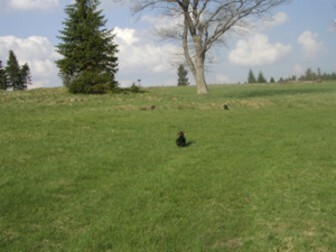 28.3.2006 We were with our puppies at meadow. It was their first longer stay outside. Both girl gayly run outside and they investigate world. 27.3.2006 Puppies are after long winter first time outside. 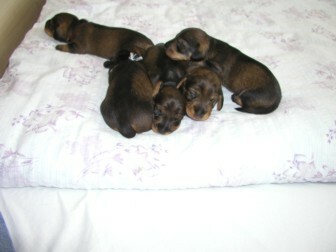 24. a 25.3.2006 3 puppies leave. Adonis, Ariadne and Apollon arrived to the new home. 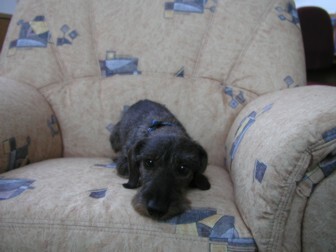 We are sad, only thinking about happiness of new owners help us to overcome this sadness. 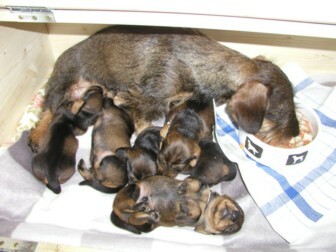 14.3.2006 arrived pedigrees for puppies. 13.3.2006 Chnapinka stopped sucking but still she is model mother! 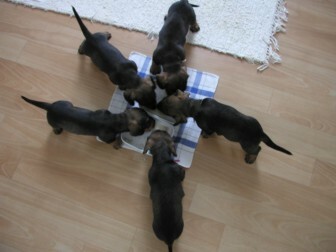 20.2.2006 Puppies started to do some expeditions throughout all flat. 30minutes activities follow 3hours of sleeping. 19.2.2006 Chnapinka is first time on her longer outing. 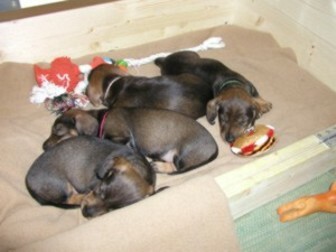 Until this day she left puppies only for must time. 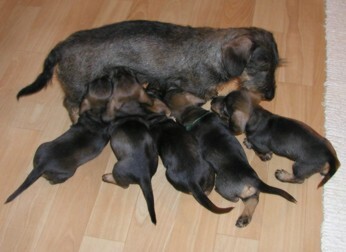 10.2.2006 Puppies daily receive visitors of all age group. It proceeds socialization. 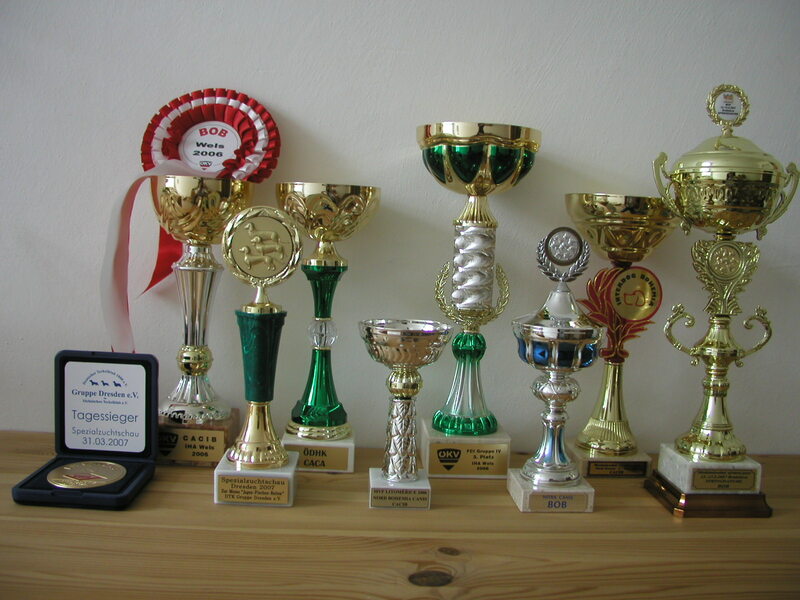 Also Chnapinka is very proud of them and she likes to show them. She listen to exclamation of passion and praise. 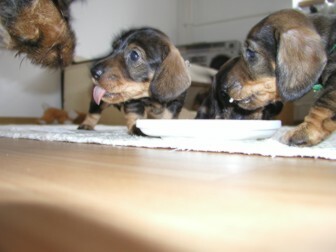 31.1.2006 We start game feeding with puppies. 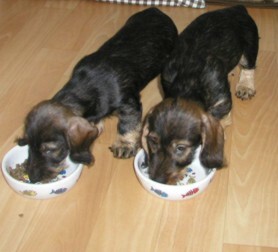 30.1.2006 Puppies took a walk around they lair. 28.12006 15th day - puppies started to growl, yap and they bite each other. 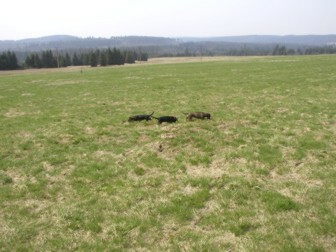 They also started to walk. 23.1.2006 1st eye was open in the lair. 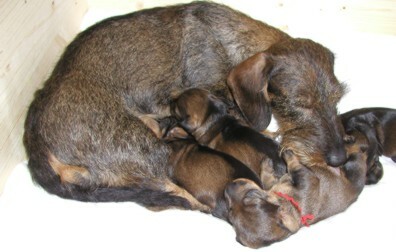 13.1.2006 Chnapinka´s first babies was born – litter A. She is doing well.